A glorious bump up against Nines 2. Actually it wasn't really that glorious, more in the nature of Inevitable, Nines 2 having the misfortune of being a rather poor crew this year and we're pretty good. After yesterday, today's race plan was obvious: us to get Nines 2 quite early, about where St Neots got them or perhaps a little earlier: before the end of First Post reach. But behind us, ah, the Sharks, who would surely know we had a slow crew ahead of us, and be out for blood, and therefore come up like a rocket. The first part worked fine: we got a decent start, peak 1:20, and had only faded to 1:37 when we hit Nines. It got pretty choppy under the A14 bridge and closing in on them, but that doesn't seem to have affected our speed much. The second part didn't happen: City 3 didn't gain at all off the start, and indeed when we last saw them they were being hard pressed by Tabs 3 (who blew up not much later). What we hadn't thought of was that the Sharks knew we'd get Nines, and saw no reason to put themselves out pushing the start hard for no possible gain. Its nice that they were so confident of us. Afterwards, to Queens for some club beer, tactfully leaving Nines (who were also boating from Peterhouse) to weep in peace. There's a video of the M1 division on the reach which gives the lie to the Sharks' "Yours is the Reach and everything that’s in it (St Neots. Just not quite close enough for the overbump)" though perhaps they were allowing themselves poetic license. So the same sandwich as yesterday, Champs Juniors in front and Cantabs Juniors chasing, but with a little more knowledge. It wasn't going to be easy. We had a shaky start with a few recovered crabs caused by the weeds. Cantabs gained ground but we remained calm, we'd seen them off the night before and could do it again. 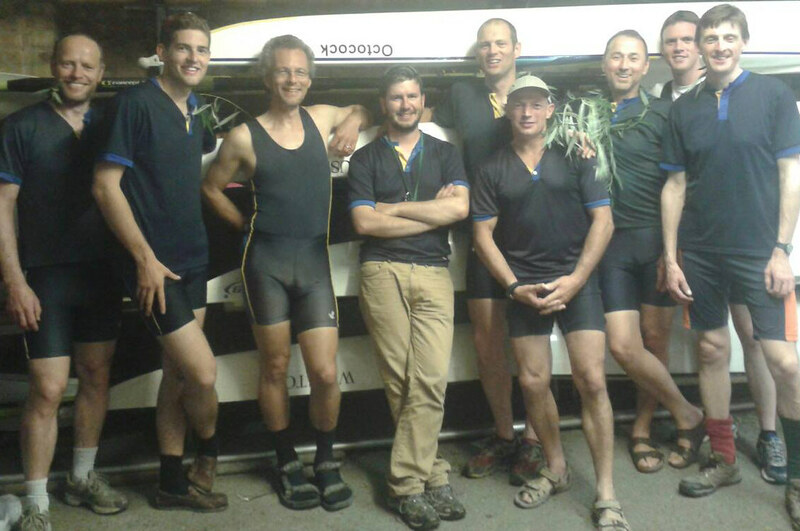 Coming out of Grassy we started to gain on Champs in front, a length, half a length, at the Plough we had overlap, we could do it our cox said, there were whistles from the bank and cheers from the Plough. Just 5 more strokes we had a good line round Ditton but had to take a good corner, another 5 strokes and "Hold it up" we'd done it. As can be seen by all the willow in the picture. Small note: the picture is a re-uploaded version of this but with the colour balance "fixed", i.e. jiggered in Gimp. The first half of W1 is nicely captured on video here; highlight is the COWS on City. 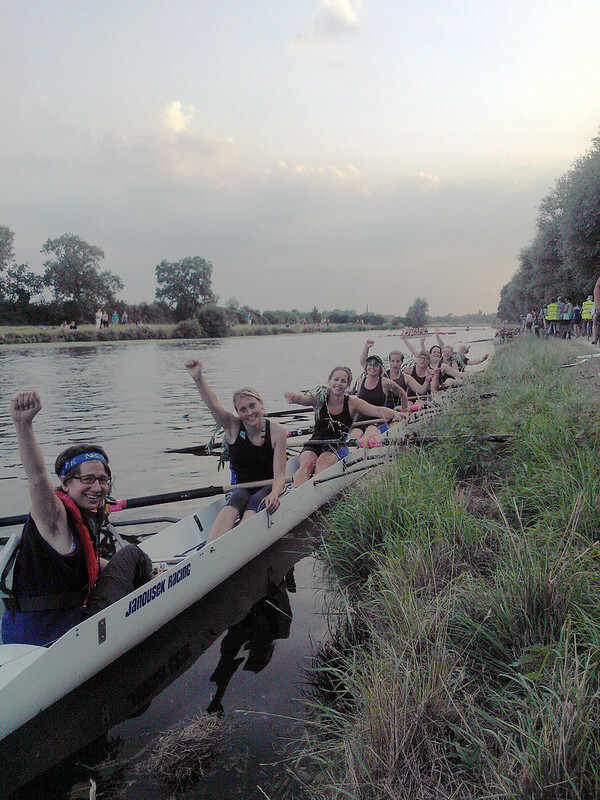 M2 improved on their result of yesterday by rowing over. You can re-live the last few exciting seconds as they push to the line here. Ahead of them, Nine 4 have knocked Tabs 7 (Poachers) down, so they have a fair chance on Thursday. Here they are coming round Grassy (about 2 mins in). This year, M2 are building a brand new, two storey "Bump House". Plans drawn up, management team assembled... Architect -KW...Project manager -SE...Site forewoman-VG. Regs consultants..Wykeham Connolley & co. Crew hired..fired..head hunted..and retired. Start date 16th July 2013. Let work commence... Tuesday. In a great flurry of smoke and whistles, our old bungalow of fear and uncertainty was demolished by the great wrecking ball of 99's M4. Site(and sight) all clear. Wednesday, Sleeves rolled up, builders bum glistening, in the evening sun. We pushed, we heaved, we dug deep and laid those foundations good and strong. Thanks to our forewoman Vicky, for great leadership and direction throughout, staying very cool under pressure and ensuring we prevented a late collapse (oh...and for not eating all the pies). Good job well done. Foundations laid. Today W2 had Champs to chase. After a slower start than yesterday they started to gain ground by the A14, but Champs were gaining on Cantabs in front. Cantabs caught a crab and slowed right down and it looked like Champs might get them first. This was the time for a Bumps 10 and yes they got them shortly after the A14. Well done W2. Up two! Unfortunately W2 had the poor taste to bump out early again, but you get to see them in the distance towards the tail end of this video. Amy, Emmsie and Roy are in there too.